Title: "The Avengers Break Up!" ...it takes the rest of the Avengers 47 seconds to capture Captain America. They tell Cap about how great he is. Sometimes when me and my friends play Halo or something, if combined they manage to get at least half my score i tell them they did a good job, too. After the workout, Iron Man suggests that Rick Jones be made an official member of the team. You know, like the Wasp (No really, he makes that comparison). 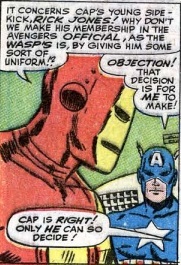 Captain America objects, saying that is a decision for him (Cap) alone to make. Jerk. 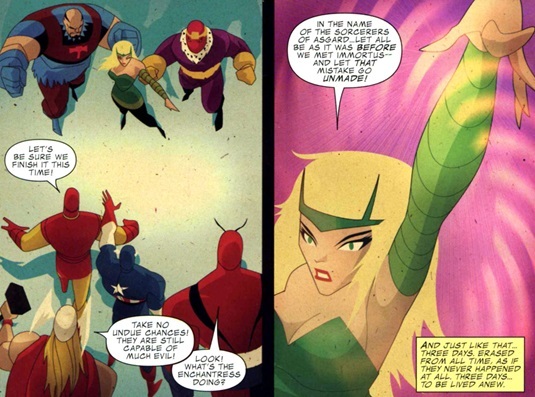 Meanwhile, the Masters of Evil, which now consist of Zemo, the Enchantress, and the Executioner, are contacted by Immortus. He tells them he wants to join their group. They tell him he can only join if he destroys one of the Avengers. He says that he'll defeat them all (then what does he need the MOE for, a bridge club?). Immortus' scheme involves putting out ads for giving people super powers, knowing that Rick will look into it. Rick is captured by Immortus. Cap goes to investigate and Immortus tells Cap that the rest of the Avengers told Immortus that the best way to control Cap was to kidnap Rick. Cap doesn't quite believe it (i'm amazed he can even follow it; i barely can) but still goes off in a huff to confront the other Avengers and bring them back to Immortus. Immortus makes each of them fight an analogue from the past (except the Wasp). 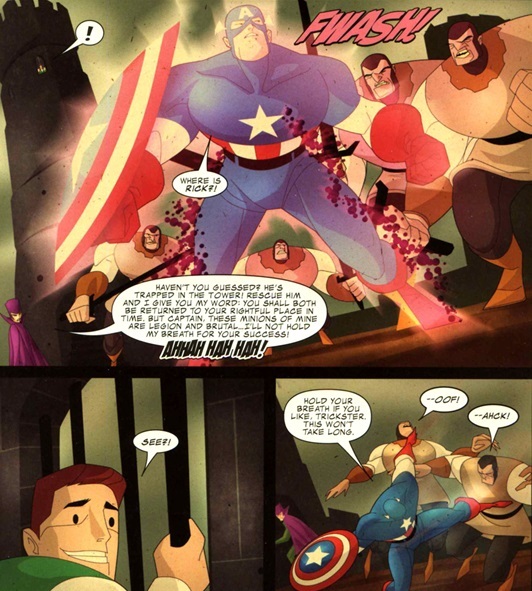 Then the Masters of Evil show up and Cap goes back in time to rescue Rick and... oh it's just a mess. 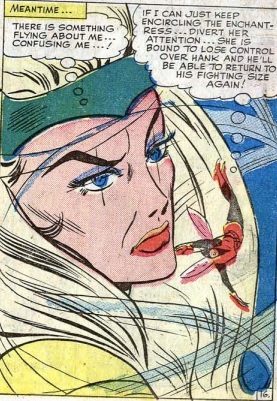 In the end the Enchantress reverses everything and i have a headache. 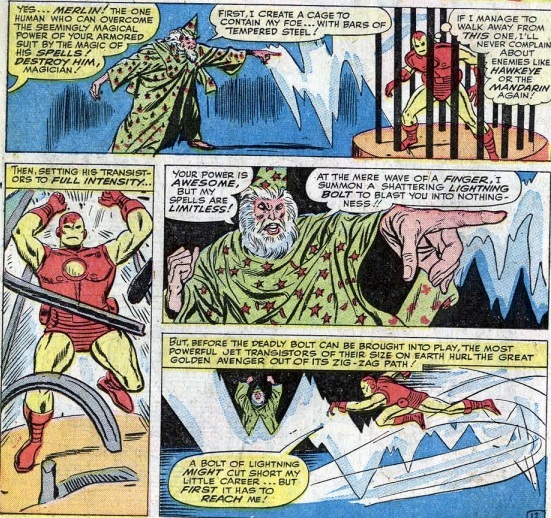 I don't understand Immortus' motivation in this story at all. In later stories he won't be a bad guy exactly, but here he seems to just be bored and looking for something fun to do, like hang out with Nazis and evil gods. Admittedly, that does sound like a good time. There's a "Hercules" in this story, one of the warriors that Immortus brings from the past, but much later in Avengers Forever #8 it's stated that he and the other historical figures Immortus summons are actually Space Phantoms. 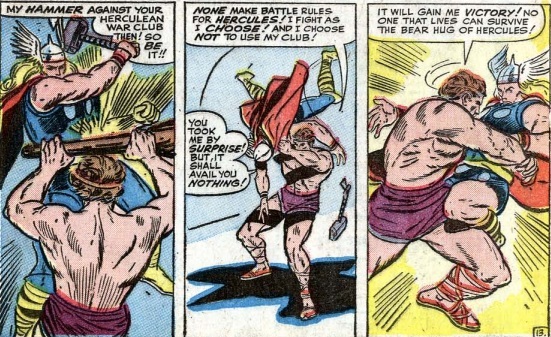 Thor doesn't seem to recognize Hercules, and he also doesn't comment on the fact that he looks and acts differently than his usual (not yet published) self. Although at the same time Thor's words and thoughts don't directly contradict the idea that he may already know Hercules. 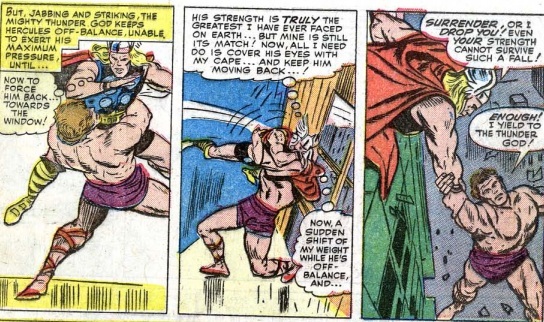 Due to a coloring error, Thor is wearing short pants most of this issue. 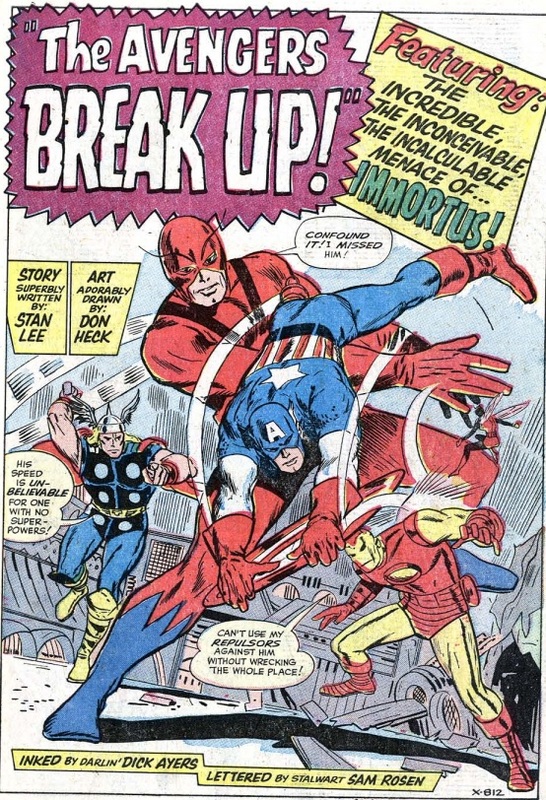 The Avengers Classic back-up focuses on Rick Jones while he was a prisoner of Immortus. In the main story, Rick was sent to "a high tower in 18th century London". In the back-up, it's the 17th century (maybe a mistake, or maybe an attempt to be more historically accurate). Rick is still in a prison tower, and he's sharing a cell with an old man who eats rats to survive. ...and in the process, Rick's cellmate becomes free as well. 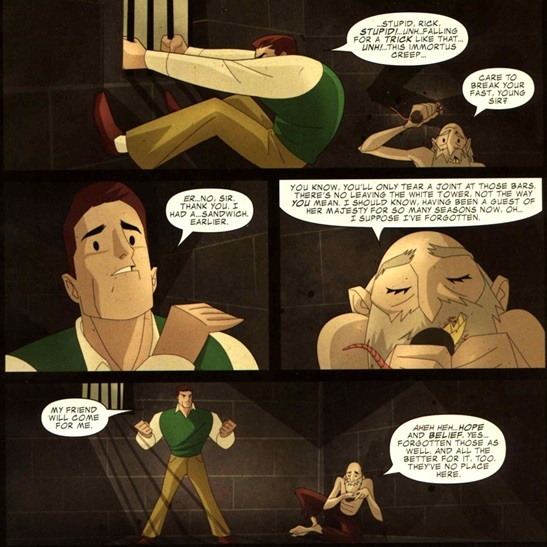 ...it also puts the condemned man back in his cell. The story is actually kind of enjoyable in its bleak cuteness, and i do like the cartoon cel art. Going from the main story to this can (as usual) give you whiplash, though. Chronological Placement Considerations: The back-up takes place during the main story, while Rick Jones was made a prisoner in 17th or 18th century London. 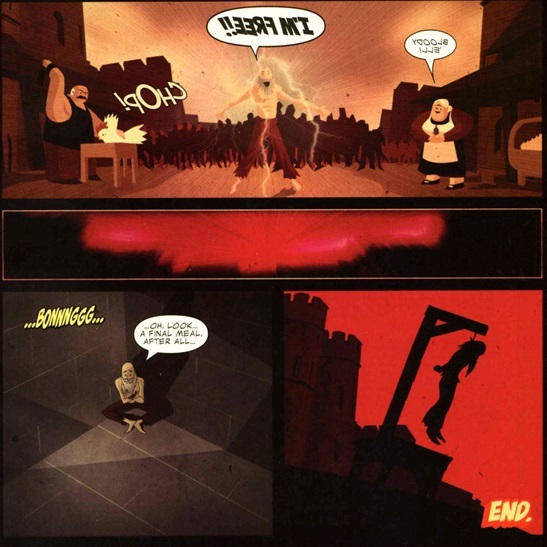 Odin took the Enchantress and the Executioner's powers in Avengers #7. The most likely reason that we don't see Immortus again for a decade is that DC had a Doom Patrol villain called General Immortus who debuted in 1963. The Doom Patrol got cancelled in 1968 and their Immortus didn't appear again for almost another decade after that, probably letting Marvel feel free to bring theirs back. 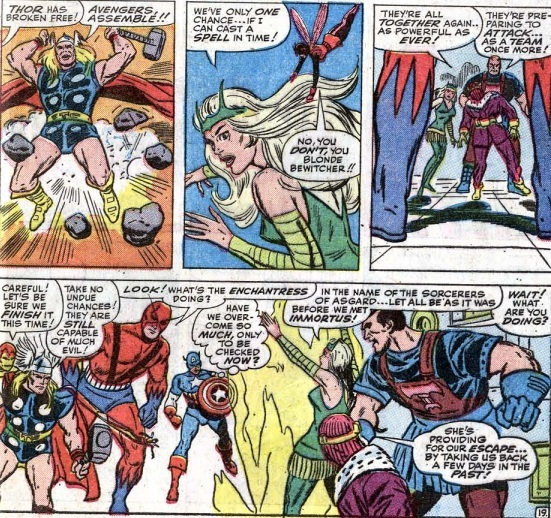 In this issue the Avengers' battle cry is used for the first time. It's slightly different(has a comma--is Thor using the vocative case? :)), than the classic version we're used to, but there it is on page 19: "Avengers,assemble!!" When this was reprinted in Marvel Triple Action #5, Hercules was retitled Samson. Mark, i have Marvel Triple Action #5, and he's definitely called Hercules, not Samson. He's called Hercules multiple times. Maybe it was for another reprint? It would have been an interesting stealth-retcon. The source article I read must have cited an incorrect reprinting; unfortunately I don't know what other place this book was reprinted in(but it would have been before 1982). Amazing Heroes #55 claimed that "Merlin" here was a Dire Wraith. 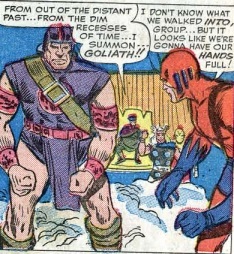 I wonder if Immortus was just sitting around and thought to himself - the Avengers just beat me as Kang. I should try again as a new person. Who do you think decided years later, hey, those two characters were introduced basically back-to-back. Let's make them the same person! I like how Thor says "even your strength cannot survive such a fall!" but Kirby drew what looked like a fall a normal person could survive if they were very lucky. Sorry, I meant Heck, not Kirby. I don't think Immortus long absence had anything to with anything at DC. The story was lame and no one thought enough of the character to use him. Englehart decided to bring him back and work him into being yet another identity for Kang. hi fnord, I understand why you do it, but putting the back-ups with the originals really pollutes the purity of the classic issues. And the change in art styles is jarring. Its your choice but I wish there was a way to separate the good old stuff from the crappy continuity inserts. like separate entries.